is so light that it will stand up on its own with very little support. It floats on top of your cake as if defying gravity. The white snowflake contrasts beautifully with the sparkling silver cake. This snowflake cake topper is perfect for Christmas, New Year’s, or just because! that are each 1/4 inch wide and 5.5 inches long. This will make a snowflake cake topper that is around 5 inches wide. Cut your strips longer if you want a bigger snowflake. You can also make your strips wider or thinner based on your preference. A thinner strip will give you a more delicate looking snowflake cake topper. and you will be left with a hole in your snowflake! Place two strips vertically on either side of the first vertical piece. This will start a weave pattern. Loop and attach two strands that are kiddy-corner to each other. Use a small amount of water to attach the loops together. Repeat for the other 3 corners. This will form one half of the snowflake cake topper. Repeat steps 2-6 to form a second snowflake half. Lay one snowflake half upside down on top of the other. Line up the loops of one half with the straight strand of another. Using a little water, attach all the loops to the straight strands. *IMPORTANT* When attaching the loops, keep the straight strands flat against your work surface and push the loop down towards the straight piece. This will make a little overhang that we will cut later. If the loop is lined up with the end of the straight piece, then you will be left with a snowflake cake topper that is curved. When you go to attach the snowflake to your cake, you will be left with a droopy snowflake. Curved snowflake that will not stand up straight. Snowflake with a straight back that will stand up straight on a cake. Clip the long straight strands to line up with the ends of the loops. Line up a toothpick or skewer tip with the bottom of your snowflake cake topper. Wrap a small strip of wafer paper around one of the straight strands and attach with water. Use the skewer tip to make a little pocket. To attach the snowflake to your cake, remove the skewer and push the skewer into the cake to only leave a small tip sticking up. Place the snowflake on top of the skewer, using the pocket you created in step 11. Using a loop that sticks out further than the others will make the snowflake look like it is floating. If you have a loop in your snowflake that is shorter than the others, consider using this as your bottom loop. If it is anywhere else, it will stick out like a sore thumb! Using thinner strips will make the snowflake cake topper look more delicate, but will be just as easy to handle! This snowflake was used with strips 3/16 inch thick. Add a little sparkle to your cake! I used Wilton Pearlized Silver Sprinkles. Enjoy your perfect wintry cake! 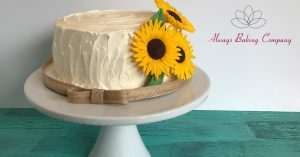 Do you love this cake topper but don’t have time to make it now? Pin this image for easy reference later!